There’s bar food. And then there’s post-bar food. Those tacos, those fell into the latter category. After college, I predictably kept the safety-net low-paying, entry-level job as a drone at SkyNet that I used to pay my some of my way through school to work for a bunch of people who undervalued me only slightly more than I undervalued myself. I was quiet, reserved. I did what I was told, showed up when I was supposed to, and somehow managed to fill out a weekly to-do list with the fluffiest of fluff – always leaving off the biggest accomplishment of the week. Smothering another section of my soul. I missed the quiet. I missed dreaming about the future, what I was going to be when I “grew up.” Being an adult sucked. And the second the clock on my very-closely-monitored-as-if-I-were-a-criminal PC clicked over to 5:00pm, I was running out the door to the half of an apartment I shared with the anti-Shawnda in a transitional area of town that was half pouring-distance-to-great-night-life and half lock-yourself-in-after-dark. Most weekends, she felt it was her mission in life to liberate me from the spinster-in-training delivery Star pizza and a game of Madden to bounce between douchey clubs full of douchey poeple, all vying for the chance to pour another round at the drop-dead-gorgeous brunette, and by association, the blonde bored-as-hell-and-kinda-bitchy-and-angry-at-the-world friend (as many a wingman would describe) next to her. Rule #1: Guys who didn’t want to – or worse, couldn’t – talk football with a girl didn’t get to talk about anything else with the girl. More than once I went to the bathroom with the intention of hopping into a cab cab to drive me back home after making a pitstop at Chacho’s. Now that was truly worthy of putting on pants and eyeliner after 8pm. Chacho’s was where the real party was. A few texts and a cab ride later, a few fellow spinsters-in-training and I would converge to celebrate escaping another wingman who had no respect for personal space with tortillas so fluffy and thick, you’d be hard-pressed to pass them off as tortillas. 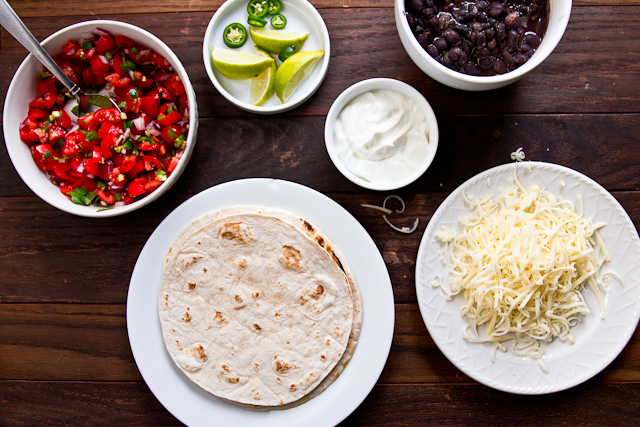 Call ’em what you want, but they served as the perfect vehicle to The Black & White: a burrito loaded with black beans, white cheese, sour cream, and then the predictable burrito white noise of shredded lettuce and tomatoes. You ordered it as a half or you had them cut a whole one to split with a spinster-in-training. Like the Texas Teas at the Marquis II, you didn’t tackle a whole one by yourself and remember enough about it to be able to brag the next day. But those Tuesday half-price teas are a story for another day. Today the story is a decently fulfilled, happy-with-life, still-LOVES-to-talk-football, non-spinster blonde whipping up a more manageable version of the black & white for her husband and daughter. 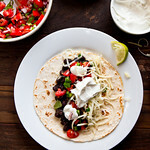 Black beans, Monterrey jack cheese, and sour cream (or Greek yogurt) make for a fantastic meatless taco worthy of reminiscing about the old days. Top warmed tortillas with 1/4 cup of black beans, a generous pinch of cheese, pico, sliced jalapenos. 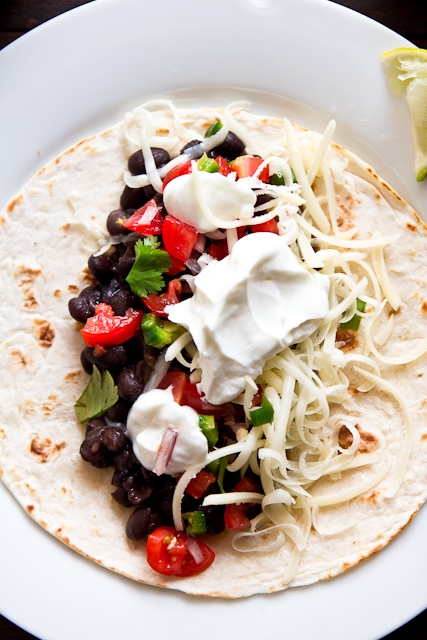 Squeeze a lime wedge over top before dolloping yogurt/sour cream and rolling. 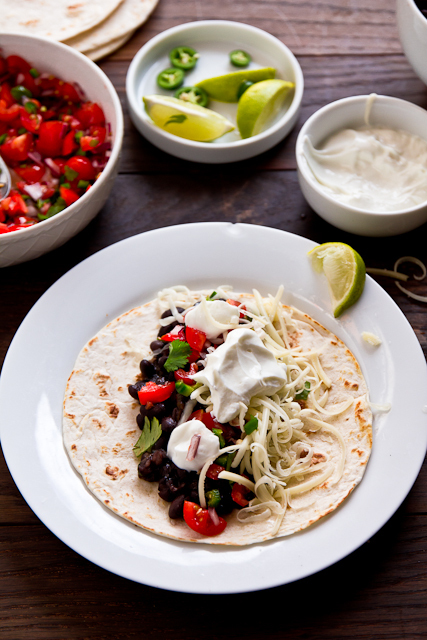 Black bean tacos are my favorite. Love the story of anti-Shawnda! i have yet to grace chachos with my presence. i’m thinking this is going to happen soon. these looks so good! We would have been REALLY good friends if we had known each other in college (or just out of college). I was WAY more into the pizza or burritos at the end of the night than the actual going out part. I just wish we had had a Chacho’s!! Time to make up for lost time! I love that non-spinster blonde. These sound great!